At the height of “the bubble years”, the years of plenty leading up to the economical crash of 2008, when Icelandic bankers and businessmen seemed to have endless money, a fundraising dinner for UNICEF was held in Reykjavik. British actor Roger Moore was the guest of honour and all the local millionaires showed up, dressed in formal attire. An after dinner auction featured various things such as “a week on a yacht in the Mediterranean”, and “a ride in the world’s fastest car”, but also “an unpainted painting by Hallgrimur Helgason”. The buyer was free to choose the subject matter. This last named item caught the highest bidding of the night and went for a record sum of almost 200.000 euros, causing an outcry in certain circles: The crazy price was considered to be a sick sign of all the excess and madness of the business elite. The whole affair also caused some confusion. Many people believed Helgason got the money in question, instead of UNICEF. (The money was used for buying mosquito nets for people in Guinea-Bissau, Africa.) Still the artist had to paint the painting, a work that already was the most expensive contemporary painting ever sold in Iceland. 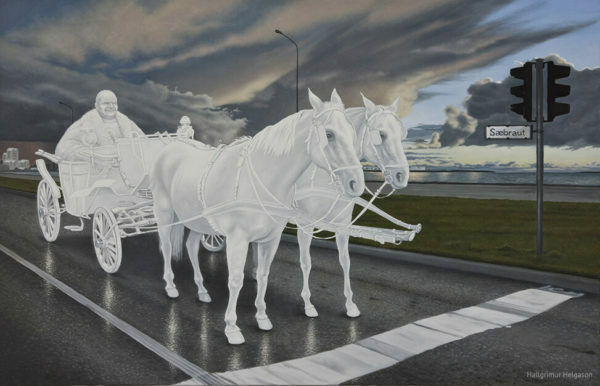 For two years Helgason pondered the question what to paint, before settling on a picture of God riding a horse carriage through the streets of Reykjavik early in the morning. The painting “God on Sæbraut” shows the fat and quite mammonic Buddha-like figure of the oversized Creator waiting on a red light close to Borgartún, the main business street of Reykjavik, seemingly heading out of town. Only a year later it seemed as if God had forsaken the city.